AMES, Iowa — An Iowa State University emeritus professor and former animal science department chair was honored for his contributions to the nation’s livestock industry Nov. 13 when his portrait was added to the Saddle and Sirloin Gallery. The 2016 Saddle and Sirloin Club Portrait Award was presented to Maynard Hogberg at a ceremony in Louisville, Kentucky. 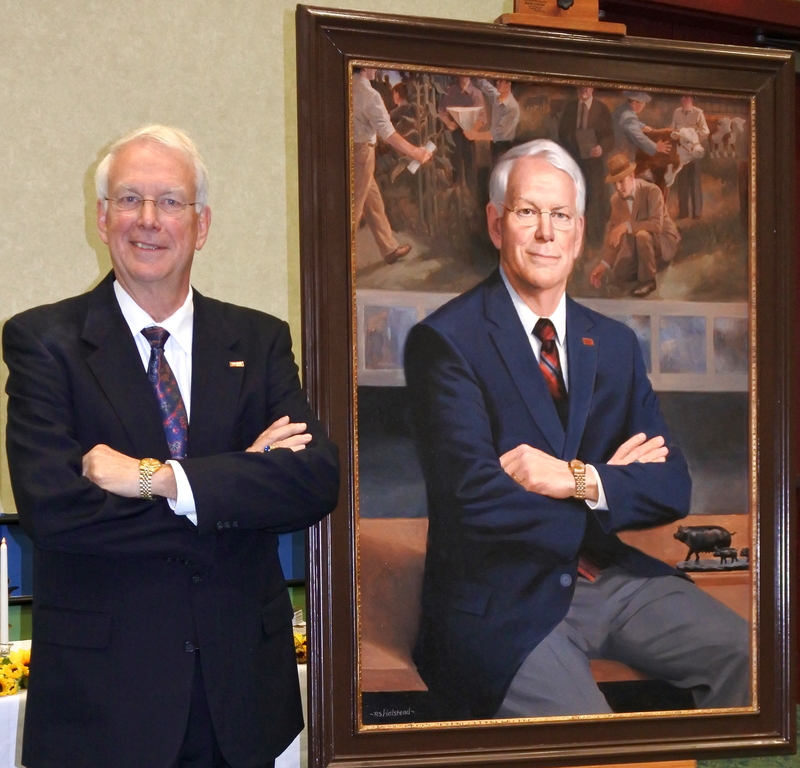 Hogberg’s portrait was unveiled as the newest entry in the Saddle and Sirloin Club Portrait Collection, a 113-year-old tradition honoring leaders who have demonstrated lifetime achievements and provided outstanding service to animal agriculture. Hogberg led the animal science departments at Iowa State and Michigan State University for three decades. He served as chair of Michigan State’s animal science department from 1984 to 2002 and chair of Iowa State’s animal science department from 2003 to 2015, when he retired. Founded in 1903, the Saddle and Sirloin Portrait collection honors individuals who have demonstrated lifetime achievements and significant accomplishments in the livestock industry. The gallery is believed to be the world’s largest portrait gallery commemorating a single industry and honors stockmen, leaders and pioneers who helped establish and advance modern animal agriculture. One individual is inducted each year. The Saddle & Sirloin Portrait Gallery is curated by the Kentucky State Fair Board and is displayed throughout the Kentucky Exposition Center. Hogberg joined the ranks of other notable names in Iowa State history, including Seaman Knapp, Charles F. Curtiss, Henry Kildee, Jay Lush and Richard Willham. Willham, an emeritus distinguished professor, was the last Iowa State person to be inducted, in 2004.